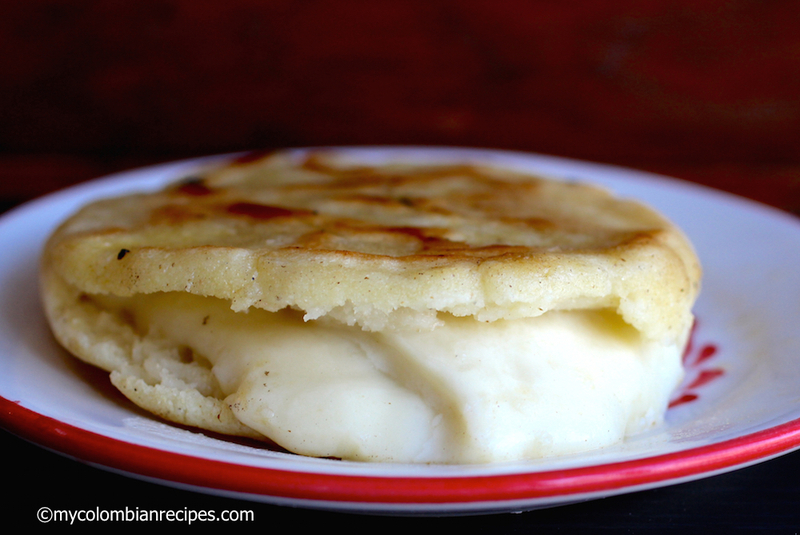 Arepas are definitely one my favorite Colombian dishes and these stuffed arepas with mozzarella cheese or Arepas Rellenas de Queso are absolutely delicious. Mesa Harina can be found in any supermarket in the flour or latin section. I also like to make these 1/2 the size and serve along side a salad or soup. Dovetailing Tip: Any leftovers make great lunch sandwiches for the next day. Pop them in the microwave for 45 seconds or until warm and enjoy. 1 In a medium bowl mix the mesa harina, water, salt and butter. Knead with your hands for about 3 minutes moistening your hands with water as you work. 2 Form 6 small balls with the dough. Place each ball between 2 plastic bags or parchment paper and with a flat pot cover flatten to about 1/3 inch. The arepas should be about 5” in diameter. 3 Add the butter to a nonstick pan over medium heat. Place the arepas in the pan, and cook about 3 minutes on each side, until a crust forms or until they are golden brown. 4 Split the arepas using a knife as you would do with an English muffin and stuff wit 2 slices of mozzarella cheese. 5 Place the stuffed arepas back on the skillet over medium high heat and cook 2 minutes on each side or until the cheese is melted and serve immediately.